Well, these are the dice that Hasbro admitted infringing! When you hold them in your hand you'll be able to see why. 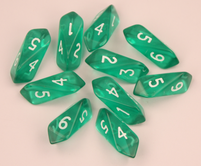 Beautiful translucent crystals are wonderful to the touch and to celebrate our victory, we going to offer these at a discounted price for a limited time. Crystal dice covered by US Patents #5,938,157; #6,318,720; #D455,462.